For this extraordinary middle school, field trips are a common thing. Every Tuesday and Thursday CELC (Connecticut Experiential Learning Center) has “outdoor ed”, which often consists of hiking, working at a farm and similar outdoor activities. But today for “outdoor education”, CELC helped serve food for the Branford Community Dining Room. 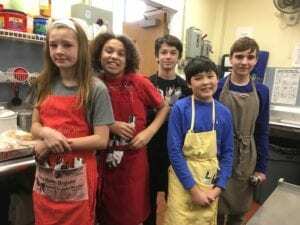 While there Matt, Harper, Emma, Ethan, and Evan served and cleaned tables from 12:00 to 1:00 p.m.
“It is not only a place for people who struggle with getting enough food, but also for seniors who have no way to get out and socialize,” Courtney the Director said. As the CELCers arrived with excitement, Elizabeth (a long-time volunteer) explained what they would be doing. When the people got to the table of their choice, the students served the tables to which they had been assigned. As they served, they were delighted by the smiles on the peoples’ faces, some of whom may not have the ability to cook for their families or to socialize easily. “It was heartwarming to serve people,” said Emma. The students also began to notice how lucky they are to have food on the table for breakfast, lunch, and dinner.